Honor a loved one or someone special in your life by sponsoring a Learning Lab—the educational rooms we use for Literacy and Math tutoring. Individual, family, foundation or business names will be prominently displayed outside the Learning Lab on a special sign as sponsors. Anonymous sponsorships are also available. Funds from room naming sponsorships will be used to help individuals participating in our core educational programs. Naming sponsorships are available for one year, multi-year, and ongoing frequencies. 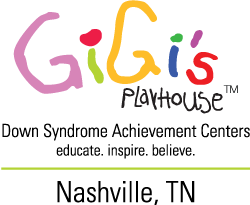 Please contact us regarding sponsorship levels and availability at nashville@gigisplayhouse.org. Our 2014 Down syndrome awareness calendar has been created to inspire all who see it—just as our children inspire us! This is an excellent tool to share the potential and depth of individuals with Down syndrome—it makes a great gift for teachers, therapists, family and friends! All proceeds go into spreading positive and accurate awareness about Down syndrome! Community lemonade stands, school dance-a-thons, wine tastings, driving range days, and exotic car shows are just some of the types of local events you can create to support our individuals with Down syndrome and the core programs they utilize every week. For more information on how to host a fundraising event for your local playhouse, please contact us at nashville@gigisplayhouse.org. Brides and grooms can make a charitable donation on behalf of their guests in lieu of wedding favors. You can also make a donation in honor of someone's birthday or wedding anniversary. When you make an occasional gift, we can send a card to your honorees informing them that you have given the gift of confidence, belief and achievement on their behalf. For more information on occasional giving, please contact us at nashville@gigisplayhouse.org. Leaving a legacy of financial support through a bequest, life insurance policy or other planned gift arrangement in your estate planning, you can continue to support individuals with Down syndrome for years to come. We will always have many individuals and families to support each year, your bequest will provide programming, family resources, and continued advocacy long after you are gone. Your planned gift to GiGi's Nashville will truly be your legacy to our individuals.